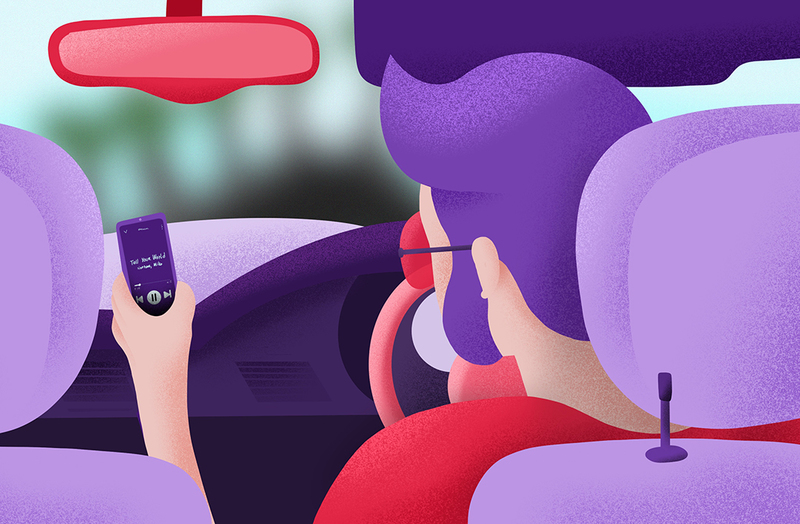 What do you do when you’re designing an app that may be used when driving? You know it shouldn’t be used, your users know it’s against the law, but you know it may be used. Interestingly Spotify recently made a few updates to their Android app to make it much easier to use while driving. While they may also make these updates on the iPhone app in the future, I recently noticed it on my Huawei P10. Like many people I have a radio with Bluetooth in my car. I hop in, it connects to my phone and plays whatever Spotify playlist I’ve been listening to recently. However, a lot of the time I’ll pick a Florence and the Machine or Lorde album to sing along to for my drive before I get going. Recently though, once the phone has connected, I’ve noticed that I’m presented with a different view of Spotify that I’m used to, a more stripped-down version. At first it was just the current song view that was changed. The icons were much larger, the pause button for example was bigger than my thumb, the font was bigger, and the album artwork gone. Confused by this change I pressed the settings icon in the top right corner where I was presented with the option to turn off “Car View”. This was my first hint that the app had updated, and Spotify was now offering this functionality. While I was impressed by this update, I didn’t think too much about it until about two weeks later when there was a further update. Once again this was on the current song view but this time, they were trying to make it easier for the user to change playlists or albums while connected to their car. To do this the user simply clicks a gradient coloured button at the bottom of the screen to bring up a list of what seems to be recommended or their most recently listened to albums and playlists for the user to choose from. This addition got my attention for two reasons. The first reason being that this is a much easier way to cycle through your music than using the regular view. Rather than having to search for an artist or playlist you simply scroll through a list of 15 suggested playlists, artists, and albums. Once you’ve scrolled to your desired playlist it immediately begins playing, no need to for any extra clicks or precise touches. This makes it easy to change your music even when you’re not looking at the screen. The second reason this update intrigued me wasn’t a UX decision, it was a UI element, the colour choice. Maybe it’s just because I love gradients, 2019 seems to be the year of the gradient, but I thought the use of different gradients for each playlist/artist was refreshing. It’s a colour treatment we’re just not used to seeing within Spotify’s products, perhaps within their playlist cover art and marketing but not splashed all over a screen in the app. To me this colour choice is not only visually appealing but helps the user to quickly see that they have changed playlist while scrolling. Between the gradients, the large icons, and how simple it is to change playlists, it’s clear that Spotify are trying to make their app easy to use when you can’t give it your full attention. It’s an interesting problem they are trying to solve, rather than just hoping their users wouldn’t use their app while driving, Spotify have decided to make it easier to use tin order to make it safer. In doing so, Spotify have given us an interface which is more concise and doesn’t fight for your attention, which cannot be said for most apps on our phones right now. Personally, I would love to be able to activate this interface while not driving, for example while working, in order to change your music without being faced with the endless choice and subsequent distraction that Spotify, by nature, offers. Perhaps in the future Spotify may offer us the chance to choose between this minimal interface and their default view.